In the edition of the Morpeth Herald of 24 September 1864 a whole column was devoted to a report on the annual Blyth Regatta. Large crowds had lined the river bank to witness a victory in the ninth race of the day for a sculling boat named "Harry Clasper". Harry Clasper was born in 1812 at Dunston on the Tyne and died in 1870. The obvious inspiration for the naming of this boat, he was a working-class, rowing hero in the North East. He also made and developed boats. His funeral was attended by upwards of 100,000 people and even today his name is locally well known. Rowing in the 19th century attracted a huge and fanatical following and also a great deal of money which was undoubtedly a large part of its attraction. Clasper was not the only rowing hero. The names of Robert Chambers and James Renforth are arguably just as famous. They were the source of much local pride when taking on the crews from the Thames. Renforth even competed in New York. When he died there from the effects of performance-enhancing drugs (named Yankee Dope in the local press) The Newcastle Chronicle devoted nearly seven columns to the story. The men were feted in contemporary music hall songs by the likes of Joe Wilson and Geordie Ridley, who wrote "Blaydon Races". A decent living could be earned by a successful rower. My Great Great Uncle, Kit Barrass, was able to buy into the pub trade and had ship owning interests when he became too old to row competitively. Rowing was the principle enthusiasm of North East sporting crowds during the later part of the 19th century. It was later eclipsed by Association Football which rapidly became popular after 1888. Newcastle United's first Division One game in 1899 attracted 20,000 spectators, with attendances rapidly increasing to 55,000 during the next decade. It is noticeable that the column inches in the Blyth newspapers devoted to aquatics diminishes rapidly after this period and is hardly mentioned at all after 1914. The sport was by this time almost completely an amateur pastime. The River Blyth was always the little brother of the Tyne in terms of size and the quality of competitive rowing. From early in the 19th century it had been the custom to hold boat races and regattas on the Tyne. A large number of keelmen and wherrymen were employed on this river. Keel boats and wherries were narrow-draught vessels used to carry cargo from the bank down river to larger boats lying in deeper water. Keelmen held races, not only out of sporting rivalry, but for the prize money to supplement their meagre wages. The really big money, however, was in challenge races between scullers for a side stake. The races between Thames and Tyne crews were typically for between £150-200, over £20,000 at today's rate. Even local races on the Tyne could attract a prize fund of over £50, which is more than £5,000 today. Gambling also featured prominently around the rowing scene. A smaller number of Keelmen also worked on the River Blyth. Keelmen's housing is shown near the Bedlington Iron Works and where Regent Street stands, near the market place, in the Centre of Blyth. Rowing became popular among most groups of working men however, especially miners. But the sport also attracted the interest of all sections of Blyth society from Lord Ridley downwards. 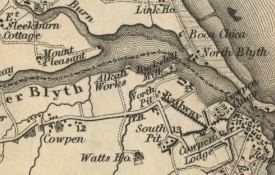 By 1864 rowing had been established on the Blyth in emulation of the Tyne activities, no doubt aided by the dredging and development of the river in the previous decade. "In 1886 the ARA issued General Rules for Regattas. The ARA adopted Henley Royal Regatta's restrictive definition of amateur which not only excluded those who made their living as professional oarsmen but also anyone who is or has been by trade or employment for wages a mechanic, artisan or labourer. Moreover, the new rules stated that only clubs affiliated to the ARA could compete in regattas held under ARA rules, and that ARA affiliated clubs could not compete under any other rules, nor against crews not affiliated to the ARA. This ruling was extremely socially divisive, effectively excluding any club with a socially mixed membership. It resulted in the formation of a breakaway organisation in 1890, the National Amateur Rowing Association, whose clubs could draw their membership from all social classes and occupations." The regatta of 1864 mentioned in the introduction, already an annual event, featured twelve races in total. Thirty-six boats were entered in total in a diverse mix of keel, coble, sculler, four-oared boats and sailing boats. The latter turned out to be a slow and ponderous affair due to there being only the lightest breeze. 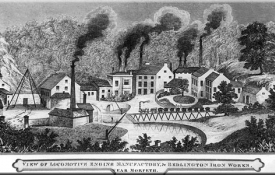 The regatta was organised in connection with the Bebside and Sleekburn collieries and the Bedlington Iron Works. 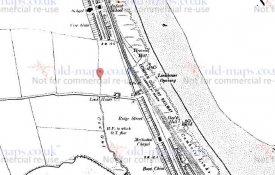 The location of these works is no doubt in part to do with the location of the race being from the "Straight Quay", near the railway bridge, to the Cowpen Style" some three-quarters of a mile down river. Typical prize funds were between £1.00 and £1.16s (roughly £120-170 in 2014 values). A large crowd enjoyed the fine weather and picturesque scenes along the banks of the river. A committee had been formed to organise this event and no connection to any works, as in the previous year, was mentioned. In fact, the regatta was headed by Commodore and judge R. Bell esq. The Commodore had a barge anchored on the river from where the Cowpen Colliery Band entertained the crowd. The barge acted as the starting point for the races. It was common for a flotilla of vessels to accompany the boats on race day. Large crowds also attended on this day encouraged by the fine weather, which once again due to lack of wind made the sailing race a farce. The races as in previous years were diverse and were for prizes just in excess of £1.00. However the main interest of the day was in the skiff handicap consisting of three heats and a final, with three boats in each heat. Michael Blakey won the first prize of £7.00 (roughly £745 in 2014). Detailed descriptions of the races and events are given by the Morpeth Herald throughout the 19th century. Four Blyth miners travelled to Whitby to race in cobles against a local crew of fishermen. It was for a stake of £20 (roughly £2016). They were well beaten, but admired for the fight they put up. It was a huge event in Whitby with crowds accompanying the winners at a victory parade. A whole column was devoted to this in the Morpeth Herald. A boat race was held between two Blyth Scullers: William Williamson and James Boyd. They were team mates who had recently beaten a team from Bebside. A debate had then ensued as to who was the best of the pair and a competition was duly arranged. The "respective backers" were confident in their selection but the Morpeth Herald does not mention who the backers were. Several thousand people witnessed Williamson win comfortably but the reporter noted: "it is an impossibility to convince some Englishmen they have been thoroughly broken on the water and so there is some talk of another race being arranged for". A usual course had by now been established between the Flanker and the Gut. Williamson was racing again, this time against Joshua Rawlins of Bebside for a stake of £50 per side. This was a return match from a race Rawlins had won in February. The Morpeth Herald article mentions many more individual skiff and sculler races having been held throughout the year. Much training had taken place in the weeks leading up to the races, with rowers being based at, and allied to, various public houses along both banks of the Blyth, such as the Brown Bar Inn - a name long-since defunct. The annual regatta was held in favourable weather attended by a crowd of thousands. The list of patrons reads as a "Who's Who" of the great and good in South East Northumberland: Lord Eslington MP, MW Ridley MP, Major Duncan RA, WB Beaumont esq MP, Major Ismay, Hugh Taylor esq, and R Wilkinson Mayor of Morpeth. A lifeboat and sailing race was held, but the main event was the skiff handicap race. This consisted of three heats of three boats and then a final heat. The prize was a "splendid" cup with £5 added. The annual regatta was held on a blustery day. The Morpeth Herald reporter stated: "The prize list was much more limited than in previous years. The absence of a prize for lifeboats, which was the chief feature of previous years, but, considering the limited funds at their disposal, the secretary Mr J Turnbull and his committee are to be congratulated on the interesting contests they were able to secure." Despite the lack of patronage there were still a great many races held. There is no hint, however, as to why the patronage for the event suddenly ceased. Morpeth Herald: "On Saturday afternoon was once more commenced a regatta on the River Blyth in the presence of a large concourse of spectators. In former years Blyth Regatta was looked forward to with a great deal of interest as nearly all the best rowers on the Tyne used to take part in the various contests, but for several years no regatta was held... A few months ago a committee was formed for the purpose of once more making an effort to re-establish it, and to a certain extent the have been successful in their efforts." Quite clearly it takes a great deal of organisation and backing to stage a regatta, which had probably not been held in the previous twelve years. It is noticeable that in the many open-boat handicaps held on the day the newspaper does not mention any prize fund. The course was over a half mile distance from the Flanker to Monkey Island. Several individual challenge races were held between scullers in this year. The Morpeth Herald of 16th September reported on a contest between Anthony Scott and R Nicholson for £50 (£5441 2014). All of these men were local to the Blyth area. This was eclipsed, however, in a match for £100 between John Bewick and William Gibbons over the two mile Flanker to Cowpen Gut course. The MH printed: "A match of the same public interest had not taken place at Blyth since November 1887 when Charles Carr and William Gibbons were the contestants." A noticeable revival was under way in Blyth aquatic sports. During May and June an "open-boat" handicap event was set up by the Seven Stars Pub, or North Blyth, Rowing Club, as it was alternatively known. Various publicans along the River Blyth had sponsored the event. This had probably been the case throughout the course of the last few decades. But the murky world of gambling had not been reported on much. Thomas Lee of Cowpen Square was the starter on the day and the main organiser behind the event. A former rower, although not the most successful, he would come to be the driving force of Blyth rowing for years to come. In July an accident happened to a sculler, a trimmer named Tom Forster, whilst training on the river. He capsized his boat and narrowly escaped death when he just managed to cling on to his upturned craft. A regatta was held on the Blyth in this month. Not many details are reported except that large numbers witnessed the event from paddle steamers, which was fortunate for them as the weather was inclement. The annual regatta held in July of this year was a sailing race only, held in the bay and harbour, and had severed connection with the rowing clubs. The patron was the Home Secretary and principal landholder in Blyth Sir Matthew White Ridley. A well-attended meeting held at the Golden Fleece public house voted to establish a rowing club. The newly-named Blyth Rowing Club had the promised support of several "influential gentlemen" although they were not named in the press. Thomas Lee was elected as Chair and de-facto secretary. Several promising scullers joined the club. The first business of the new organisation was to purchase a boathouse on the riverside. An advert for an Easter aquatic event in Blyth appeared in the Morpeth Herald. Rowing was noted as being popular in the North at that time. The 4th annual open-boat handicap for the Isaac Tucker Cup was held over the course of the Easter weekend. It was organised by the four-year-old Blyth Rowing Club. The challenge consisted of three rounds, a semi-final then the final. Thirty-two competitors entered in total. The first round consisted of sixteen heats. The rowing club had obviously managed to secure themselves a club house by this stage as the course of the race was from here to the Shearlegs. It was noted that a large crowd of spectators had attended. The sponsor, Isaac Tucker and Co Turks Head Brewery, was established at Gateshead in 1790. They had fifty tied public houses at their commercial height. The cup in this year was won by G. Davis. Throughout this month the Morpeth Herald devoted a great deal of column space in anticipation of an international rowing match between the four-oared team from Blyth Rowing Club, which included the holder of the Tucker Cup G. Davis, and a team from Glasgow. The paper stated that the team's preparations were going well. Arthur Jefferson, owner of the Blyth Theatre Royal and father of yet to be famous Stan Laurel was the main sponsor of the event. He had paid the travelling expenses of the Glasgow crew and provided the trophies. Blyth won the match and an awards ceremony was held that evening at the Theatre Royal. 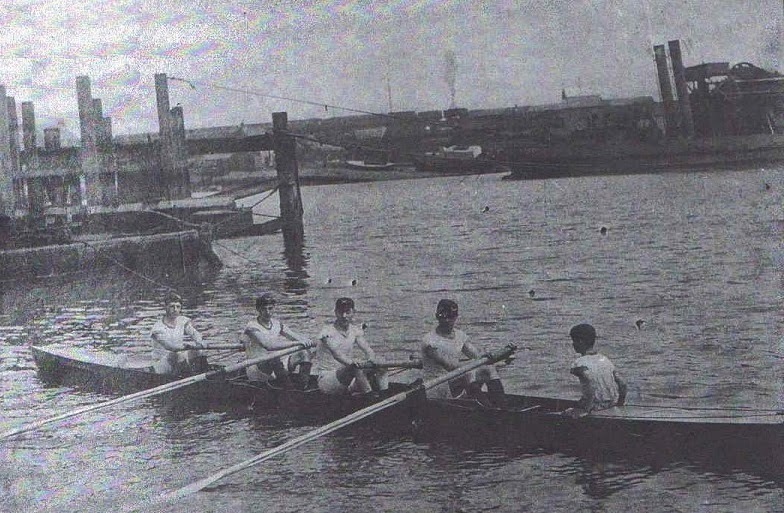 The same crew had also won the prestigious Durham Regatta earlier in the year, and would also go on to victory in 1909. The MH also wrote: "A much larger crowd had attended the event than had been seen on the Blyth for aquatics in many years". The Morpeth Herald reported on a dissapointing Tucker challenge cup event. It was held once again over the duration of the Easter weekend and the usual half-mile course. But the weather was poor and in the opinion of the reporter so was the quality of the competitors. G. Davis failed to appear for his semi-final heat leaving C. Allen free to become the overall winner. The annual event for the Tucker Cup was moved from the Easter to the Whitsuntide weekend. This was in the hope of of more favourable weather for spectators and the ever-increasing amount of novice rowers competing in the event. The prizes were presented in August at a ceremony in the Jefferson's Theatre Royal. Mr. Fred Perry represented Isaac Tucker and Co of Gateshead. He gave a speech where he praised Blyth for having the best single sculler and best four-oared crew in the North of England, having won at various northern regattas. Blyth's club was now leading the way in North East rowing. Thomas Lee presented the accounts to the Blyth Rowing Club in December. This showed an income, and almost the same expenditure, of £11 3s raised mostly by subscriptions. A social evening of the Blyth Rowing Club was held at their headquarters, the Golden Fleece Inn, as reported by the Morpeth Herald. The Tucker Cup and medals were presented and speeches were made highlighting the many successes of the rowers over the past year with the names of the members of the Lavery and Allen families being especially singled out. Thomas Lee remarked that Blyth had a foar-oared crew to match any in the country. Bob Balmer states in the book Images of England: Blyth that Blyth Rowing Club amalgamated with another on the river in this year. Morpeth Herald: "To encourage boat racing amongst Blyth youths a handicap is to be started on Easter Monday for youths under 18 years of age". On this day the rowing club christened a new four-oared boat built by Messrs Brown of Durham. 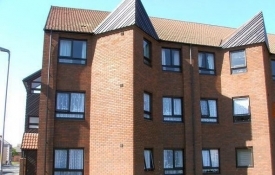 The name given was "Robert Colledge". The boat had been donated anonymously by a "lover of aquatics". It was launched as part of a town-wide event and procession which also raised money for the lifeboat and local hospital. The Morpeth Herald gives very little coverage of rowing after 1914. WWI would undoubtedly have had an effect on Blyth's rowing activities, as it did other aspects of life. It does seem, however, as if rowing had become a low-key and largely amateur sport by this time. The austerity of the 1920s and 30s also played a part in the demise of the period. Ian Wrigglesworth in his book The Social History of English Rowing comments that the 1926 General Strike "endangered the very existence of some Northern clubs such as those at Blyth and Cambois". Members of the club had been excused subscriptions until the strike ended but the lack of income must have had a detrimental effect on the club's viability. Clubs throughout the country, especially works-based clubs, had folded during the depression of the 1930s. In 1965 the Sports Council set about encouraging a participation in rowing and gave grants of £1.00 for every £1.00 raised by a club. Cambois Rowing Club was given a Council grant which enabled it to re-locate from Blyth harbour to the River Wansbeck estuary, "leaving behind the traditionally professional Blyth Rowing Club". BRC went into economic decline and ended in 1985.